I used the Kreaxions 3in1 punch to create a frame as the focal point of the card I took a couple of pretty papers and punched the border down 2 opposite edges then turn the border inwards to show the white side of the patterned paper, I then matched the papers one inside of the other to create the frame. I used the Stamping up It's Beautiful Wheel to stamp on the base card using Close to cocoa ink. 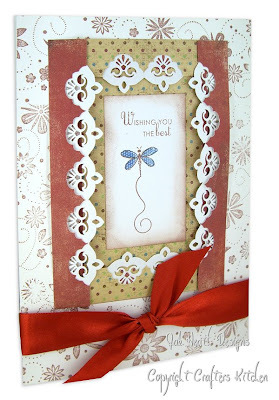 Using the Wishing You Stamp set by PTI I stamped the dragonfly in brocade blue and close to cocoa ink and sponged the edges, using glossy accent I glazed the dragon fly wings and added a pretty copper ribbon to finish. Beautiful card, very graceful Jak. It's lovely Jak, and I love the way you have used the punch to make a frame. I have a couple of those punches must get them out and have a go, thanks for the inspiration. absolutely beautiful Jak! Love your colors!